Rolo House - Parys Accommodation. Rolo House is a luxurious self catering lodge located on the Parys Golf and Country estate - a mere hour's drive from Johannesburg. Awake to the sound of rumbling water and birds singing in trees. Small to medium size pets are most welcome by prior arrangement. 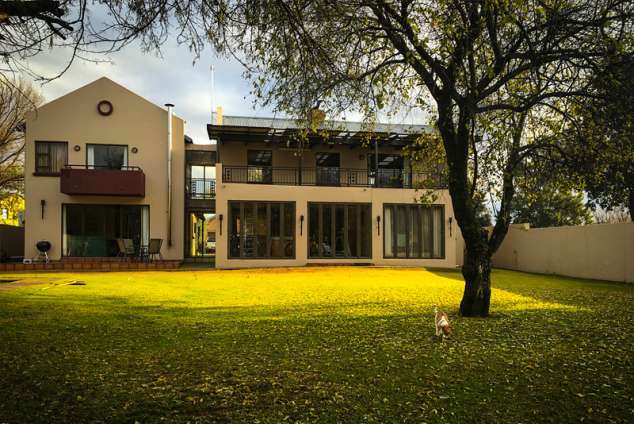 Rolo House offers a large living area with table tennis, fireplace, swimming pool with net, and a "stoep" overlooking the swimming pool and garden. One covered farm-style "stoep" on the first floor with braai facilities are overlooking the river stream. A fully equipped open plan kitchen, with a microwave, gas stove, dish washer, fridge, washing machine and tumble drier are available. Two luxury rooms, each equipped with a queen-size bed and bathrooms with double showers and bath. Two standard en-suite rooms, one with two three-quarter single beds and one with two single beds. House Cleaning at an additional fee can be arranged. Air conditioner in some areas. 7277 page views since 20 Oct, 2016. Last updated on 03 Apr, 2019.